Greymane believed he'd outrun his past. With his school for swordsmanship in Falar, he was looking forward to a more peaceful existence, although his colleague Kyle wasn't as enamoured with life outside the mercenary company, the Crimson Guard. 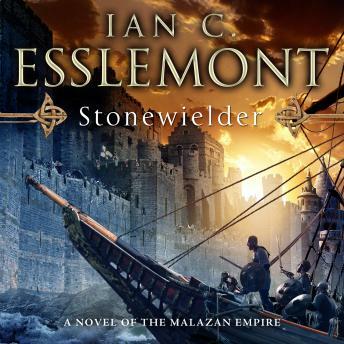 However, it seems it is not so easy for an ex-Fist of the Malazan Empire to disappear, especially one under sentence of death from that same Empire. For there is a new Emperor on the throne of Malaz, and he is dwelling on the ignominy of the Empire's failed invasion of the Korel subcontinent. In the vaults beneath Unta, the Imperial capital, lie the answers to that disaster. And out of this buried history surfaces the name Stonewielder. In Korel, Lord Protector Hiam, commander of the Stormguard, faces the potential annihilation of all that he holds dear. With few remaining men and a stone wall that has seen better days, he confronts an ancient enemy: the sea-borne Stormriders have returned.